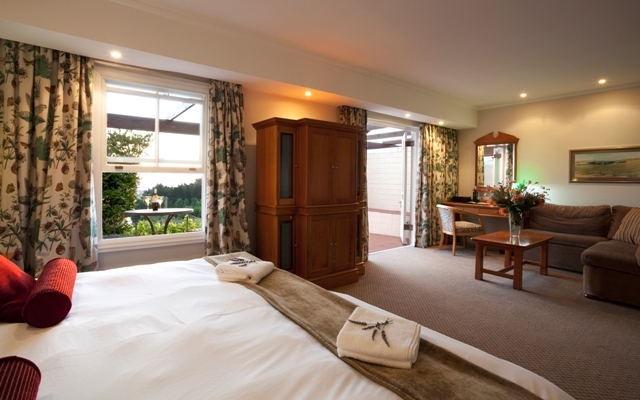 Asara Hotel is a haven of tranquility, offering warm hospitality and luxurious accommodation. The hotel has a unique location on the Polkadraai Hills, affording guests spectacular views across the vineyards and valley to the surrounding mountains, and creating an atmosphere of peace and relaxation. The hotel is set in 15 acres of lush gardens. At its heart is a central courtyard with the reception, Deli and restaurants on the courtyard, and the wine cellar and tasting room nearby. There are 40 spacious and comfortable rooms in two wings on either side of the central courtyard, with each wing designed to maximize views of the surrounding vineyards and mountains. Each room features a terrace or a balcony and an opulent bathroom en-suite. The four courtyard rooms overlook an attractive interior courtyard. There are two suites in the hotel, the Avalon and the Vineyard, and three room types, the Deluxe Room, Classic Room and Courtyard Room. All rooms offer an extensive list of facilities, free WiFi, and various little treats and luxuries.